Over the years we’ve published a lot of really fine games in the Second World War at Sea series. But it was the fourth game in the series - Bomb Alley, released in early 2002 – that made me think the game series had become something really special. Bomb Alley brought the series into European waters, introducing the Royal Italian Navy and vastly expanding the presence of Britain’s Royal Navy (which had appeared in Eastern Fleet, a much smaller game). The series got its first German ship, its first helicopter carrier, and a smattering of Greek, French, Dutch, Soviet, Romanian and Polish vessels. The game sold enormously well, and we finally ran out of them in 2009 (we put together a few extra copies after that using leftover parts and some laser-cut playing pieces). We do have all of the artwork and layout for Bomb Alley was done by real professionals, so we have all of it in our archives and ready for use. We could have made more copies, but I decided not to do that. We’ve advanced the state of our art considerably since 2002: in the look of the games, in the quality of play, and in their historical content. Bomb Alley was a very good product for its time, and would still stand up well against most games published at this writing, but that time has now passed. 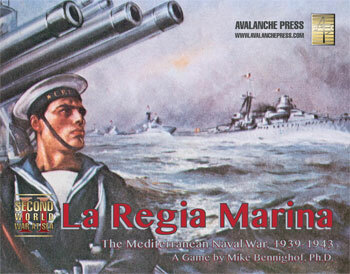 I decided to replace it with a new game, titled La Regia Marina. Bomb Alley’s map covers the right geography: the Mediterranean and Black Seas from Gibraltar to Batum. And it even has the smoking volcano at Mount Etna. Even so, it’s not nearly as attractive as the maps in more recent games. And so we’re replacing it, with a much more eye-pleasing work by Guy Riessen. We’ve changed the standard size of our paper maps since the days of Bomb Alley, from 22x34 inches to 22x28 inches. So instead of two 22x17-inch maps as in Bomb Alley, La Regia Marina has two 22x28-inch operational maps. That’s a lot of extra area, and it extends the operational map out to the west well beyond the Strait of Gibraltar to overlap with the operational map from Bismarck on the west and that from Horn of Africa on the southeast. Bomb Alley’s scenario set picks up with the Italian declaration of war on Britain and France in June 1940 and continues until the last contested Allied convoy run in August 1942. That’s an appropriate time frame, but soon after we published Bomb Alley I started wishing for an expansion book that took the action forward to the Allied invasion of Sicily in June 1943, and maybe another for the small-scale actions of Germany’s captured fleet in late 1943 and 1944. La Regia Marina accomplishes that. The most exciting part of the story does end in August 1942; after that, the Italian fleet no longer has the fuel for regular operations of its largest warships. But there are still operations by destroyers and torpedo boats, and sometimes by cruisers. And there are operations planned but not authorized due to the fuel shortage. The new set fleshes out the narrative with additional scenarios (including a great many new battle scenarios) taking place both before and after the Bomb Alley cut-off date. As with South Pacific, all of those scenarios are tied together with historical text and linking campaign games that reward you for successfully carrying out your missions over multiple scenarios. Because of its large scenario set – Bomb Alley came with 50 scenarios – the old game sort of had a scenario-based narrative; you could trace the campaign’s shifting goals and initiative based on who was trying to do what. We listed “over 75 scenarios” for La Regia Marina and I’m pretty sure it’ll comfortably exceed that number. Peggy Gordon drew the ship pieces for Bomb Alley, and she’s back for La Regia Marina. As we’ve been doing with the last several naval game releases, we’ll be upgrading the artwork even on ships and classes that have appeared before. The new printing process we started using a year or so back, which produces those silky-smooth die-cut pieces, really shows off the crisper detail. When released, Bomb Alley was the largest Second World War at Sea game to date, with four sheets of pieces totaling 840 pieces: 280 “long” ship pieces and 560 square ones. Other than the gigantic, limited-edition Leyte Gulf, no game in the series exceeded Bomb Alley in size before it went out of print. La Regia Marina is budgeted for five sheets, which comes to just under 1,000 pieces total, but I’m pretty sure we’re going to add a sixth. The Royal Italian Navy adds additional cruisers and destroyers that were begun but never completed, including captured French vessels. The Royal Yugoslav Navy appears; we left it out of Bomb Alley. The French Marine Nationale gets a much more complete order of battle. The Greeks finally get their air force. And that’s before we even extend the campaign into 1943 and 1944. The Germans captured a fair number of Italian and French destroyers and put them into service, and even fought some surface actions with them. We of course have to include this rag-tag fleet in the game. I remember watching the Peter Jackson Lord of the Rings trilogy when it came out, and a scene appeared to have been deleted (I think it was the Steward of Gondor staring into the magical crystal ball, but I’m not sure). I’d re-read the books just to prepare to see the movie, so it seemed pretty obvious, and I was disappointed that a scene had obviously been saved for the extended version to be sold separately. And sure enough, when I dutifully ponied up for the special edition DVD (complete with a little Gondor paperweight), there it was. I don’t want our fans – and we do have some – to feel similarly exploited. We’ll definitely issue expansion sets for La Regia Marina, but only because they don’t fit into the historical narrative. La Regia Marina is a big game stuffed with toys and scenarios, and no one’s going to walk away thinking that something got left out. Even so, we’ll have more, starting with re-worked editions of Black Sea Fleets and The Habsburg Fleet. We discussed those projects previously in Daily Content. There are more in the wings; La Regia Marina will be the foundation for expanded Second World War at Sea fun for years to come. We’ll set at least one more Second Great War at Sea book there, the Black Sea-themed Sword of the Sea. And we had Spain’s Armadas, bringing the Spanish Civil War to Second World War at Sea, in the works until it became obvious that Bomb Alley would sell out not long after we could bring it to press. The Long War setting, which opens with Plan Z, will also receive a Mediterranean entry. All of this adds up to a lot of great game play. La Regia Marina is a big game with a corresponding price tag, but it delivers the fun.